When speaking about Partners In Health, depending on the audience, we may talk about the needs of people we serve or the needs of institutions that serve them, but rarely both in equal measure. If it’s a social justice crowd we share stories about the lives of patients and their immediate and often desperate needs. If it’s development practitioners or public sector or institutional partners, we talk about capacity building and effectiveness and sustainability. These conversations often prioritize either the individual or the system – as if one is more important than the other. And that’s too bad, because those distinctions are irrelevant in practice. It’s never just one or the other that our doctors or nurses or patients need to worry about. So we – the collective ‘we’, meaning everyone who believes this work is important – need to think about and be aware of all of it too, all of the time. PIH Canada had the privilege of seeing ‘all of it’ in action a few weeks ago with a visit to Toronto from the indomitable Dr. Agnes Binagwaho, Vice Chancellor of PIH’s University of Global Health Equity (UGHE), former Minister of Health for Rwanda and full-time social justice firebrand. Dr. Agnes gave a talk at the University of Toronto in the morning, had some meetings in the afternoon, and attended an evening Canadian premiere screening of Bending The Arc, the captivating new documentary film on PIH in which she plays a starring supporting role. Dr. Agnes doesn’t just straddle the worlds of people and institutions; she’s neck-deep in both. She calls out global health institutions for their hypocrisy on matters of cost effectiveness, deriding policies and policymakers who say what is “cost effective” in one country (in the West) is unsustainable in another (in Africa), openly mocking the value of human life of poor people. Rwanda has been so successful in advancing and implementing pro-poor health policies because its systems and institutions have matched its public rhetoric about the dignity of all citizens. The country designed policies to make health advances happen and held leaders at all levels accountable for achieving them. 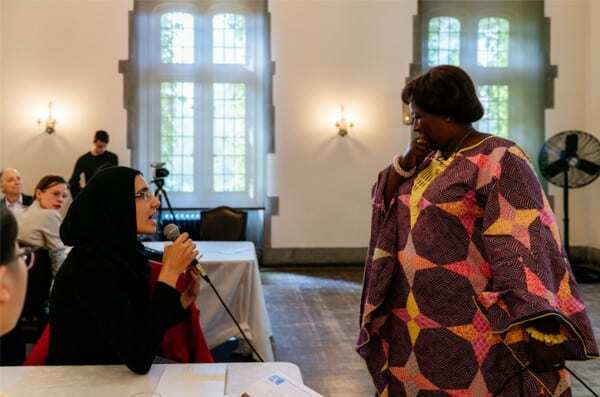 Dr. Agnes Binagwaho answers a question from an audience member during a her talk "The Equity Imperative"
Sometimes people suggest that Rwanda is inherently different from other African countries — someone said it at the U of T talk — but Dr. Agnes won’t stand for it. “We are not different,” she retorts. “We are not different.” Again and again. The only thing that comes from saying Rwanda is different, she says, is absolving other leaders from their responsibility to take care of their people. When PIH began in the 1980s, it focused exclusively on the people and the injustice. PIH set up a system of community health workers in the Central Plateau of Haiti not as part of some national plan, but because it turned out to be the best way to bring health care to people who had been trampled on by larger forces. At the other end of the spectrum today are bureaucratic institutions who too often fail to see the human trees amidst the forest … unless the forest is being burnt by wildfire or destroyed by earthquake or hurricane or some other natural calamity. How to be less risk-averse from a distance, to help people in the here and now because lives have inherent worth independent of ‘natural’ disasters, or the strength of institutions, or a performance management plan, is the ongoing challenge. We need more of the kind of urgency from institutions that drives family members or health care providers when a loved one or patient is directly in front of them. It’s eminently possible for governments and universities and any kind of organization to be disruptive in this way, provided they remember to think about people. At UGHE, doctors-to-be will spend many hours of their training listening to and learning from community health workers. Yes, you heard that correctly. The most esteemed members in society will take guidance from individuals whose basic job requirements are that they know how to read and write and have the respect of their community. So the UGHE curriculum holds an important lesson for us all: for institutions that care about equity and actual people, the knowledge held by those actual people needs to be respected and heard and fed back into policy and practice. Effective work can’t happen any other way. PS – For those curious about seeing Bending The Arc, we promise to be back in touch soon with more information!